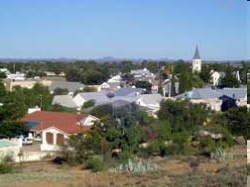 Victoria West is a unique small town in the heart of the Karoo on the main route between Cape Town and Johannesburg via Kimberley. Named after Queen Victoria and well-known for its genuine Karoo hospitality, good food, great sunsets and starlit skies, Victoria West is well and truly on the tourism map. There are many game farms and hunting farms close to Victoria West. Golf, bowls, tennis, squash and hiking are some of the activities on offer at Victoria West. An annual Agricultural Show is held in the town in February each year and the Karoo Golf Classic is held annually in May. An annual South African Film Festival is held in September in the historic art deco Apollo Theatre in Victoria West. And for something completely different, the town offers the "Mannetjies Roux Rugby Museum". Victoria West is a top farming region for Merino and Dorper sheep and Angora goats, which thrive in the dry and extreme Karoo climate with its hot summers and cold winters. Restored country houses and cottages are among some of the property investment opportunities on offer in Victoria West.